Simulates a simple DJ mixer to function with YouTube. Is there a better alternative to Mixyt? Is Mixyt really the best app in Music category? Will Mixyt work good on macOS 10.13.4? Mixyt stands for Mix YouTube. 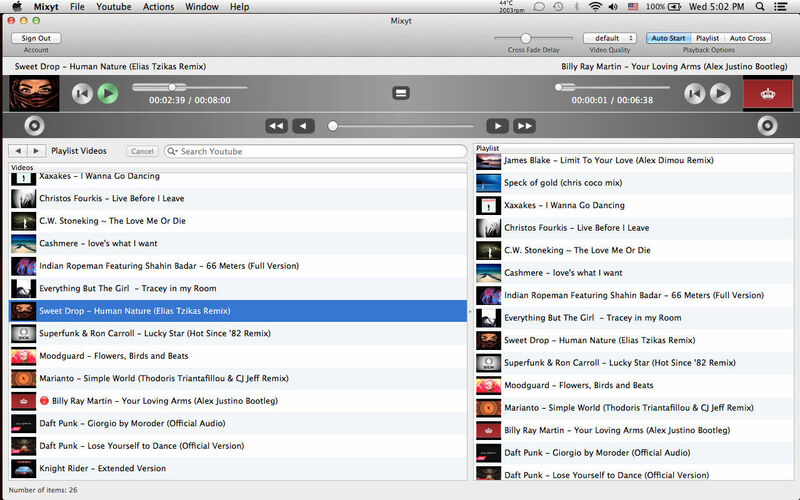 It simulates a simple DJ mixer to function with YouTube. With Mixyt, you can quickly search YouTube, locate your favorite video or song, get its related videos (songs), add them to a playlist, and navigate through your previous searches with ease. 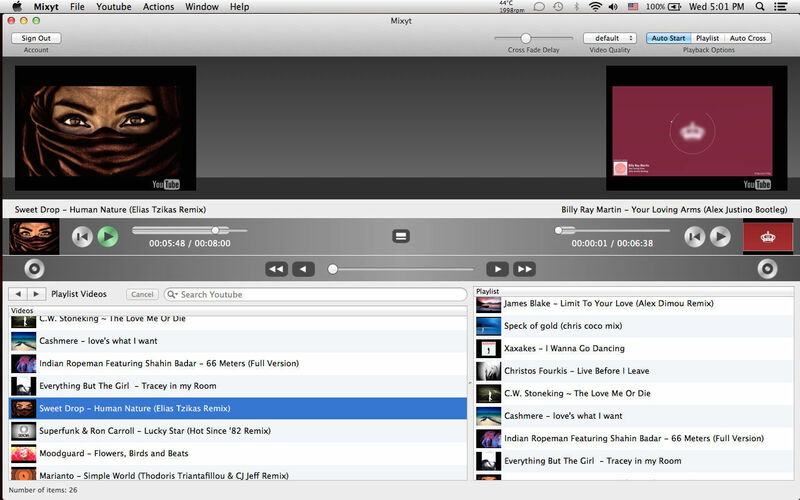 Mixyt has two players so that you can mix the audio between videos (songs). Play, Stop, and the Crossfader are the essential tools for accomplishing this task. An advanced caching technique always takes place behind the scene to minimize YouTube search delays. Fixed issues based on your feedback. Conforms to Google's latest API's. Mixyt needs a review. Be the first to review this app and get the discussion started! Mixyt needs a rating. Be the first to rate this app and get the discussion started! Of course, you may save your list so that you can access it anytime. 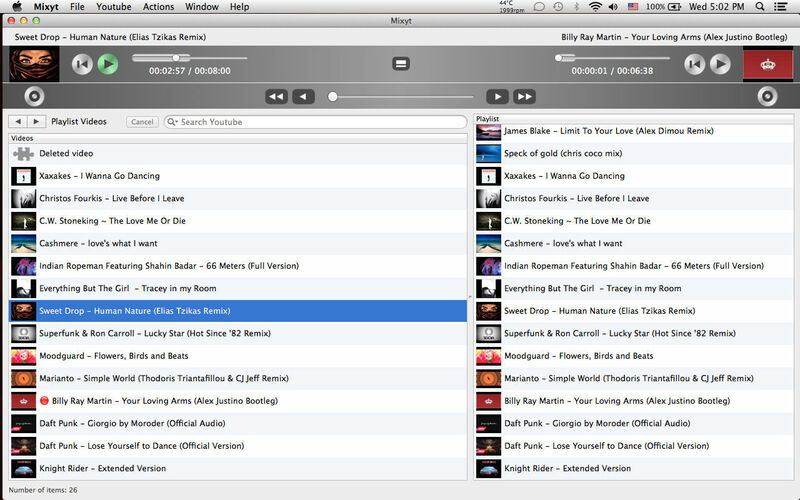 Mixyt has an autopilot (playlist mode) to automatically crossfade one video after another in playlist. This way you may just leave it to play your favorite playlists in the most efficient way. Finally, all YouTube playlists in your account, plus the classic playlists (Uploads, Likes, Watch later, etc.) are available from the main menu. Most functions are available through keyboard shortcuts to maximize your performance! Please note that Mixyt is to be used as a YouTube playback console/mixer.